News > The 2013 Honda CR-Z Hybrid arrives in South Africa! The new 2013 Honda CR-Z hybrid sports coupé launches in South Africa: racier, sharper styling, increased power output, exemplary fuel efficiency to set the standards for hybrid cars. With updated exterior looks and interior finishes, and an advanced IMA hybrid drivetrain giving increased power the new CR-Z is slick, sporty, and incredibly fuel efficiency with low CO2 emissions. A new front bumper, together with a revised grille and a panoramic glass sunroof, are among the key contributors to the 2013 Honda CR-Z's sharper looks. The keener styling theme is continued at the rear, where a new, more aerodynamic diffuser design has been introduced. Filling the sporty Honda's sculpted wheel arches are brand-new 17-inch alloy wheels with a striking design that places further visual emphasis on the CR-Z's athletic character. In addition, a new extrovert body colour - Premium Northern Lights Violet Pearl - has been added to the available palette of hues. The cabin has also undergone a series of subtle updates, including a new interior colour scheme, and leather upholstery for the sculpted bucket seats and the door panel inserts, creating a smart and sporty ambience. Standard features include Bluetooth, heated seats, rain-sensing wipers and auto headlights. Revised door panel casings allow for improved storage space, while the cabin lighting now employs LEDs. These are not only more energy efficient, but also contribute to the latest CR-Z interior's sophisticated mood. However, perhaps the most significant improvements are to be found under the Honda coupé's sleekly sculpted shape. While its advanced 1,5-litre petrol engine has been retained, this latest version employs a revised i-VTEC variable valve timing system, linked to an updated Electronic Control Unit (ECU). As a result, maximum power output has increased from the previous 84 kW to 89 kW. The IMA hybrid drivetrain couples this petrol engine to an electric motor and a battery pack. The updated CR-Z now employs a lithium-ion battery instead of the previous nickel-metal hydride design. This has allowed the power output of the electric motor to be upped from 10 kW to 15 kW. With both the petrol engine and the electric motor working in tandem, the IMA hybrid system is able to produce a combined total output of 101 kW (10,5 percent more than before) with an accompanying torque peak of 190 Nm (an improvement of 9,2 percent). The power hike allows meaningful gains in performance. The 0 - 100 km/h sprint time improves from 9,7 sec to 9,0 sec, while top speed is 200 km/h. To maximise the full potential of the CR-Z's IMA hybrid powertrain, a Plus Sport button has been added to the coupé's multifunction steering wheel. It provides access to a new Sport Plus mode, available only when the battery charge is at more than 50 percent of total capacity. The S+ mode provides instant access to the extra power boost provided by the electric motor for up to 10 seconds under full throttle. A flashing indicator in the instrument panel confirms when the S+ feature is active. It can be selected in all three driving modes offered by the trend-setting coupé: Eco, Normal and Sport. "The 2013 Honda CR-Z further underscores Honda's strength and innovation in the burgeoning hybrid car market," says Graham Eagle, director of HSAF. "The additional output places even greater emphasis on the sporty hybrid's dynamic prowess, with its impressively low emissions levels. "In addition, the keener styling and upgraded interior contribute to hybrid motoring package that is both compelling and entertaining to drive - proof that eco-friendly cars can be exciting and satisfying, too," Eagle adds. The retail price of R332 800 includes a three-year/100 000 km warranty, a five-year/90 000 km service plan and a one-year AA roadside assistance package. Services are at 15 000 km intervals. The 2013 Honda CR-Z is perfect for anybody looking for a hybrid with looks and performance. 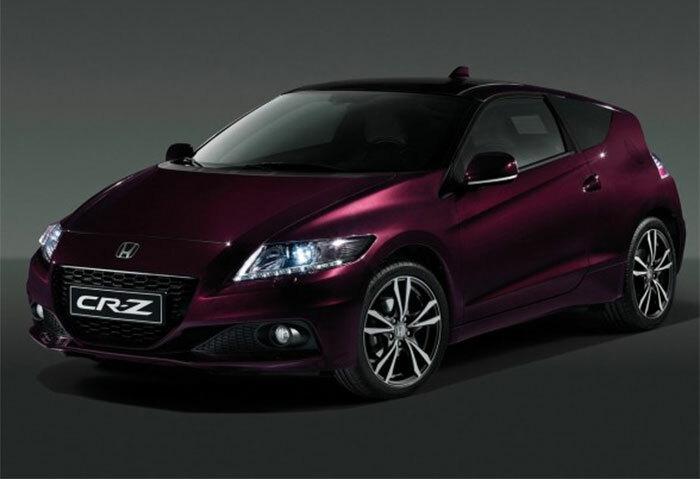 The CR-Z will be available from May 2013 from your local Mekor Honda South Africa dealer. Contact your local Honda dealer now for more information and to book a test-drive.